Helpful Links: Why is AQURON unique? 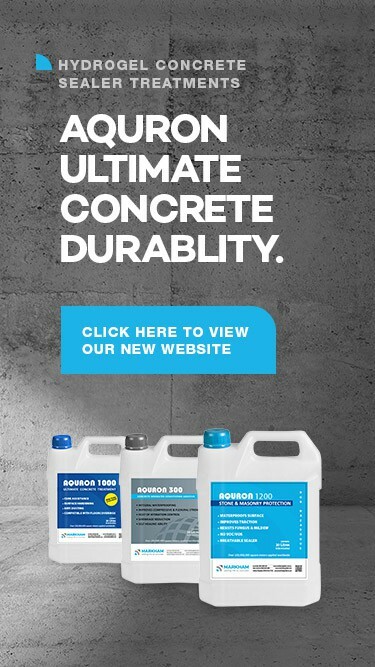 Help me understand to AQURON range of concrete treatments? AQURON spray-on penetrating concrete hardener and densifier treatments have proven ultimate performance in enhancing concrete durability, surface and internal hardness, resistance to abrasion, and anti-dusting properties. Original Research led to the discovery of a radical catalyst working in colloidal silicates which gives AQURON solution the unique action of being drawn deeply into the cementitious matrix utilising internal “free moisture” and alkaline components of the concrete to make an extensive impermeable hydrogels inside the concrete. By forming a gel throughout the concrete, AQURON stops the access of carbon dioxide, which causes concrete dusting. AQURON becomes an integral part of concrete, and provides permanent anti-dusting properties and resistance to surface damage from abrasion which is essential for exposed concrete floors that are subject to heavy wear from high volumes of foot or vehicle traffic. AQURON 1000 provides ultimate durability hardening and densifying the surface & internal concrete matrix as one. Due to its ultra deep penetrating ability, AQURON 1000 avoids the formation of a surface ‘crust’ which can potentially craze and delaminate during long term use. “The ultimate benefit of the AQURON 1000 is that it is permanently inside the concrete and does not require any maintenance other than regular cleaning and the more you use it the better it gets“. AQURON Solutions are 100% VOC free water-borne solutions, and are the desirable choice for building environmentally sensitive structures. AQURON’s performance has been proven since 1984, on over 100,000,000m2 of concrete worldwide.